I headed out to the suburbs recently to watch a cooking demonstration inside a big fancy kitchen store. Not being averse to buying multitudes of shiny expensive things at various times in my life, I find myself naturally at home in kitchen stores. Perusing the many isles and fondling crockery. Asking the difference between all the different pressure cookers, running my fingers across the knife blades to feel how sharp they are, and making a coffee on whichever mostly automatic machine they have setup on a bench, just to marvel at how bad it is. The main reason I was there though, was that the cooking demonstration was being given by Hadleigh Troy, head chef of Restaurant Amuse, and not your average chef. So when I saw “squid risotto” on the menu, I knew it wasn’t going to be the kind of squid risotto your Nonna might have made. Hadleigh takes an approach to his cooking that borders on the experimental. His use of sophisticated techniques and a focus on textural elements means his food is always unconventional, but always within the bounds of good taste. 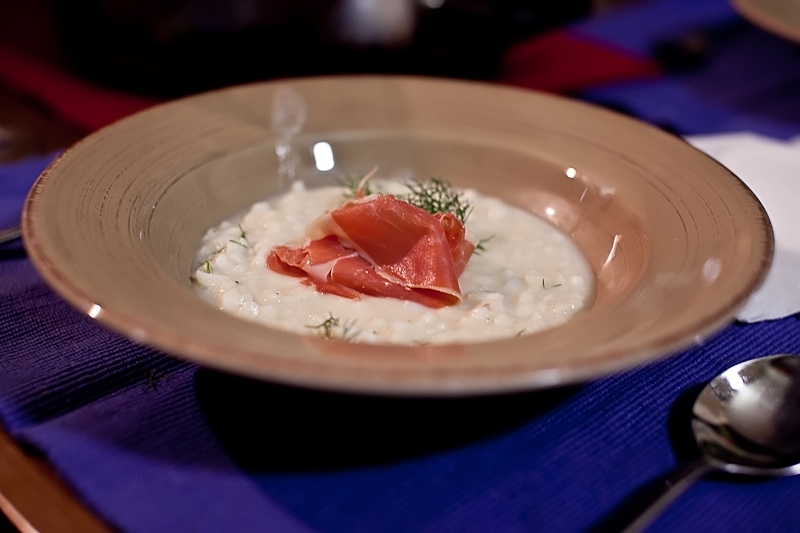 This “risotto” was no different. 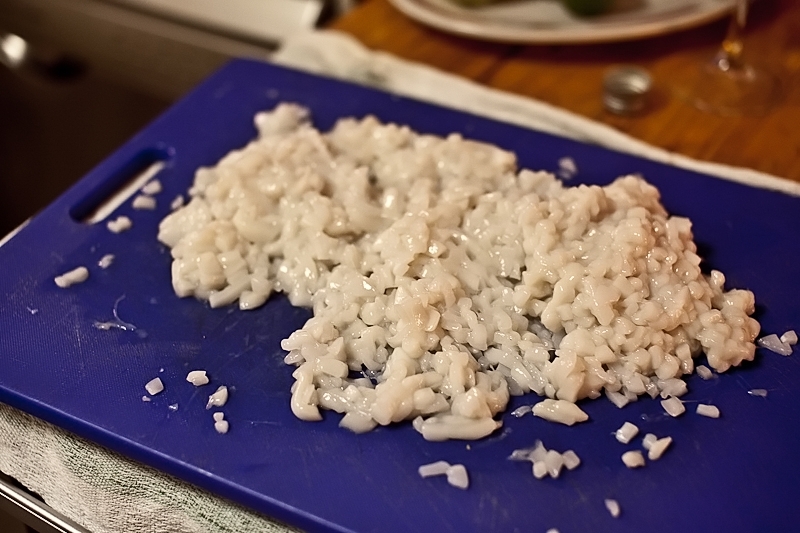 The idea being that instead of cooking rice, you’re actually *making* rice out of squid. Boom. Mind explosion. Ok, so it may not be the craziest thing you’ve ever heard (I did in fact see Mark Best from Marque Restaurant in Sydney make a similar dish on the Martha Stewart “Australia Week” show last year), but it was novel and delicious, and so I just had to try it myself. Of course squid is not the same as rice. 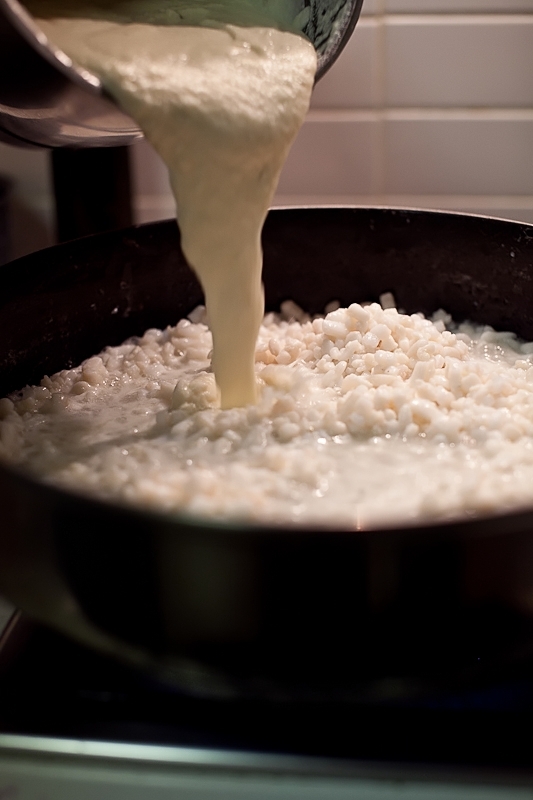 Arborio or Carnaroli rice commonly used for risotto is a starchy grain. over the period of time you cook it slowly in stock it releases the starch into the liquid which creates the beautiful creamy texture. We need to fake that with the squid version, and so the base “stock” we’re using is actually a cauliflower puree. Cut the squid tubes open, lay them flat, and using a sharp knife, very finely slice each tube into tiny “grain sized” pieces. Cut your cauliflower into pieces and put it into a pot with enough milk to cover it, and simmer it gently til soft (I actually used a Thermomix to heat mine, but the concept is the same). 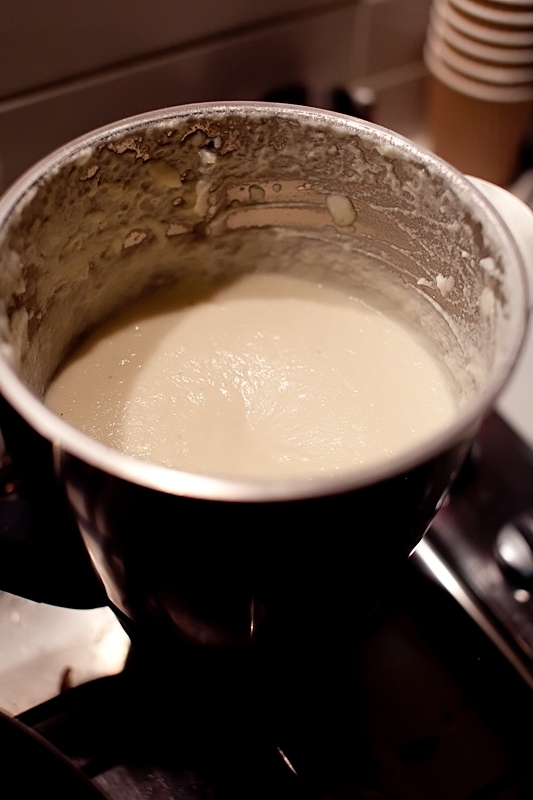 Once the cauli is cooked til soft, drain most of the milk and blend it til it’s a very fine puree. Keep the milk and add it slowly til you get a smooth consistency that’s not too runny. In a hot pan with some olive oil, quickly fry your garlic and onions til soft and golden, then add the squid “rice” and fry over a high sheet for about a minute, until it’s just changing colour. 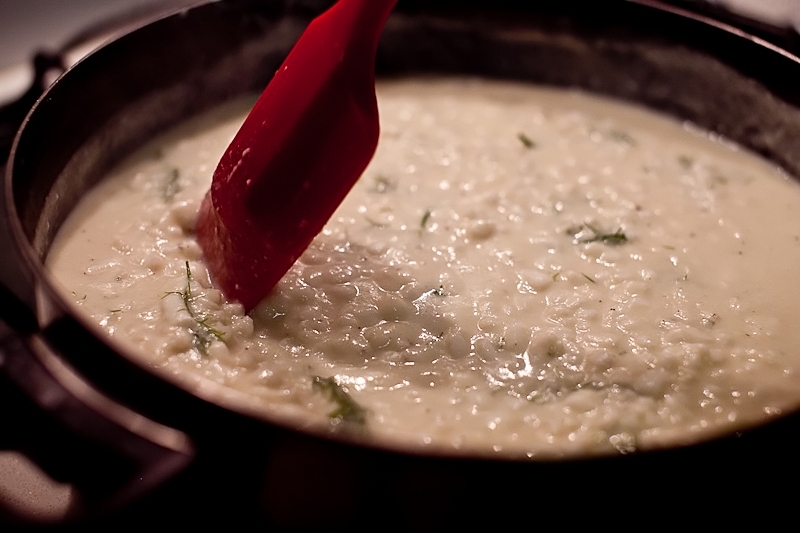 Pour the cauli puree into the rice, and stir through, seasoning with salt and pepper, and a little butter. Finish the dish on the plate with a healthy sprinkling of dill (or other fresh herbs) and a slice of jamon serrano. And there you have it. 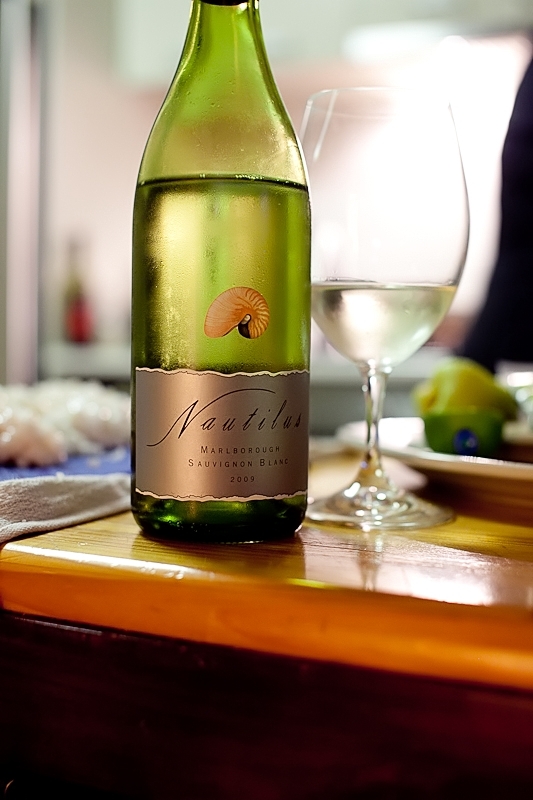 From the shoulders of giants… I served this dish up to some seafood loving friends and it got a great response. I’m not sure I’d go through the pain of cutting squid into rice grain sized pieces on a regular basis, but the textural “crunch” of the squid, and the richness of the cauliflower puree was a great combination that was definitely worth the effort. Good point Monnie, and entirely plausible. Though you’d probably want to cut the squid into smaller sections and make sure it’s fully frozen before putting it in the Thermomix, or you might end up with squid goop. That sounds gorgeous Matt. I love the combination of seafood/cauliflower, and of course, pork goes with everything! A couple of people I work with claim the Thermomix is the best thing ever….would you agree? Best thing ever is a pretty big call Linda. I like it, but I prefer cooking the conventional way. I use the TM where it makes repetitive tasks convenient and the milling capability is definitely impressive. It’s a great thing to have in the kitchen, but I could live with out if it had to. WOW, very interesting! Although cutting squid into rice grain sized pieces it’s not my idea of a good time in the kitchen. But I adore squid! I’ll be dreaming about this dish all day. Very true Camilia, there are much more fun times in the kitchen to be had, but I think the effort was worth it. Hope your squid dreams were not of the giant / killer variety. Quite spanish flavours with italian skills. I had similar rices around spain but i think never with dill. I will try! I’m not sure Spanish or Italian were really what I was thinking about, more the combination of the squid with the cauliflower and dill because it always loves seafood. I’ve been known to add it to the top of paella for a little anise edge.